Oct 22, 2014 -Here is a look at Canada’s chart. Transiting Moon at 13 Libra (6th house) opposes transiting Uranus (conjunct Canada’s Neptune in the 12th house.) A radicalized national on the loose. – Note the 12th house is the house of the hidden enemy. 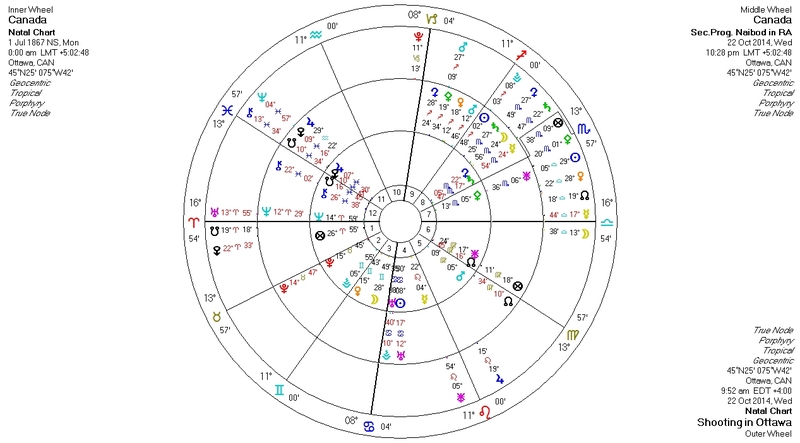 Transiting Mars in Sagittarius (9th house) opposes the nation’s moon in Gemini (3rd); also conjunct progressed Ceres Note: Our soldier (Nathan Cirillo) was shot while he stood guard at his post at the sacred war memorial (Mars in Sag in the 9th). The attacker (Michael Zehaf-Bibeau) was shot by parliament’s Sergeant at Arms (Kevin Vickers), who has both a ceremonial position and also serves the chief of security personnel at parliament. (can be viewed by both the Moon in Gemini and the Mars in Sag positions.) Moon in Gemini also correlates to the city witnesses, and the place where the attacker was actually shot – in the hallway in front of parliament’s library. It was all caught on video as the media was there to do their usual job in reporting on the government daily affairs. In addition to emergency personnel, I believe there were at least 2 people on the street who tried to assist the shot soldier. Pluto transiting in the 10th house (the government, both location and victim) opposes progressed Uranus and squares Neptune; the crisis that nobody saw coming. Transiting nodes close to the Ascendant/Descendant axis. When the nodes are situated on the Ascendant/Descendant line, something significant/major/karmic is triggered. The solar eclipse at 0 Scorpio – history pivots. The solar eclipse includes Venus in Scorpio (murder; crime; death) and Pallas Athene (the warrior goddess). It is a partial eclipse but has already demonstrated that it has enough dynamic ju-ju to alter existing reality. It widens the marker line between yesterday and today – between that was then and this is now…..
near war memorial. Near chateau Laurier. 9:52 a.m. – Ottawa police receive reports of an honour guard shot at National War Memorial near Parliament Hill. Shortly before 10 a.m. – Journalists are among the first to report the sound of gunshots in a Parliament building. CTV’s Katie Simpson reports a soldier being shot at the War Memorial outside. The soldier is later identified as Nathan Frank Cirillo of Hamilton, Ont. 10:12 a.m. – In addition to shots outside, MP Michelle Rempel tweets about shots fired in the Parliament Buildings, near where the Conservative caucus is meeting. 10:18 a.m –Tony Clement reports more than 30 shots fired as MPs flee Parliament for safety. 10:20 a.m. – Prime Minister Stephen Harper’s director of communications says the prime minister is safe and has left the area. 10:49 a.m. – CTV Ottawa Morning Live tweets that the Rideau Centre shopping mall has been evacuated. 10:53 a.m. — RCMP advise the public to stay avoid downtown Ottawa. 10:53 a.m. — RCMP advises the public to stay away/avoid downtown Ottawa. “ALL BUILDINGS are currently in lockdown. Follow the instructions from Security Services. 11:35 a.m. – Sources confirm that the shooter on Parliament Hill is dead. 1:20 p.m. – Sources confirm Cirillo, the soldier shot at the National War Memorial, has died. 1:30 p.m. – The NHL postpones a hockey game between the Toronto Maple Leafs and the Ottawa Senators. The puck was due to drop in Ottawa at 7 p.m., but will be played at a yet-to-be-determined date later in the season. 1:44 p.m. – The lockdown at the Rideau Centre shopping mall is lifted. Despite earlier reports of a shooting in the area, only incidents on Parliament Hill and at the National War Monument are confirmed by police. 2:10 p.m. – Ottawa Police and RCMP hold a press conference, officially confirming the deaths of both Cirillo and Zehaf-Bibeau inside Parliament Hill. Police could not say if other suspects are on the loose. Authorities also ask people to report anything suspicious and to avoid the downtown core. 2:35 p.m. – FBI confirms they are assisting authorities in Ottawa. 5:10 p.m. – A “safety perimeter” reduced in size, Ottawa police announce. Residents inside the perimeter asked to stay indoors until further notice. 7:10 p.m. – Security officials reinstate a lockdown for some offices around Parliament Hill as Prime Minister Stephen Harper prepares to address the nation. 8:08 p.m. — In a televised address to the nation, Prime Minister Stephen Harper says two “despicable attacks” on Canadian soldiers this week will not weaken the country’s resolve to fight terrorism at home and abroad.